Drought-tolerant cowpea has become an attractive crop among rural Zambian farmers, thanks to USAID’s Feed the Future initiative in Eastern Province. Cowpea is now more frequently used as both a food and cash crop in the Eastern Province, due to its high nutritional value for household consumption and an increase in local market demand. Africa RISING supports this development by promoting crop diversification as part of its broader agricultural technological interventions and as an integral part of conservation agriculture. 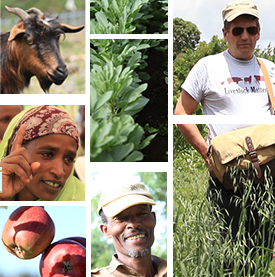 Forty-year old Thomas Banda is one of the farmers who has benefitted from project activities. Based in Chanje Village in Chipata District, he farms with his wife and seven children. For years he grew only maize, using the conventional ridge and furrow planting method, but produced only low yields, barely enough to feed his family. This conventional practice, with a strong focus on monocropped maize, limits the country’s agricultural productivity and leaves farmers vulnerable to a variety of problems, including pests, market fluctuations, and the effects of climate change. For Thomas Banda, this changed in 2014 when he became a beneficiary of Africa RISING. In a field day conducted by the Africa RISING Project, Banda volunteered to be a “legume intercropping baby-trial” host from the 2014/2015 farming season onwards. The baby trials are a scaling tool used by Africa RISING to make farmers aware of a technology and to gain first hand experiences with a technology on a small plot. Banda’s motivation to participate was also to start practicing and adopting conservation agriculture technologies using an animal traction ripper. From the 2015/2016 cropping season onwards he decided to grow cowpea on one acre of his own land. He accessed cowpea seed from a local seed grower and also used recycled cowpea seed from his baby trial. Despite the poor rains experienced and prolonged dry spell during the farming season, growing cowpea on Banda’s fields led to considerable increases in both productivity and income at his farm. He managed to harvest 289 kg of cowpea, which translates into an overall yield of 723 kg/ha. 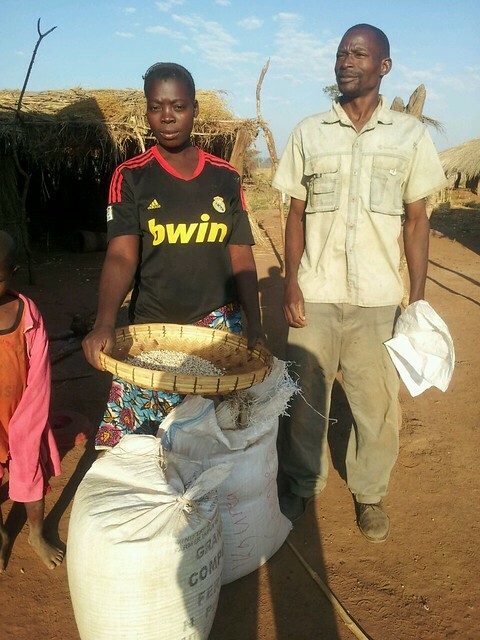 From his harvest, he sold 250 kg of cowpea to local buyers at K5 (US$0.5) per kg and reserved 39 kg for home consumption. When asked what he used the money for, he happily replied in Chichewa; “ninagulamo Nkhumba yaikazi pamtengo wa K600 ($60), komanso zina tinasewenzetsa panyumba monga kugula uniform ya mwana wa sukulu ndi zofunikila zina zakusukulu”, which translates to “I bought a pig at the cost of K600 ($60) and then used the rest of the money to buy a new school uniform and other school requirements for my child”. Convinced about his initial success, Banda plans to expand the area of planting next year. Planting cowpea, a drought-resilient crop, will be one of the strategies to adapt to counteract the negative effects of climate variability and change. Studies show that Zambia will face longer and more intense droughts as well as heat stress in the coming years. Additionally, the legume has a multitude of other advantages such as bringing gradual improvements in soil fertility, providing groundcover, feed for cattle and goats, nutrition through green leaves and, of course, grain that can be either consumed or sold. The varieties developed and promoted by USAID’s Feed the Future program are well adapted to the environment and will help farmers to diversify their current cereal-based cropping systems. Planting cowpea, therefore, provides a new income generating opportunity for smallholder farmers under Africa RISING, a project which aims to achieve long-term, sustainable economic growth and improved food and nutrition security for rural communities in Eastern Province of Zambia. Tags: africa rising, AfricaRISING, USAID. Bookmark the permalink.